Home Science for Kids 5 Ws & H Why is Hair Today, Gone Tomorrow? Why is Hair Today, Gone Tomorrow? Here’s a quiz question: what is curly or straight and needs to be combed, brushed, plaited or twisted? It is gelled, shampooed, dyed, coloured black, blonde, white, red, brown and needs to be cut once in a while. A hint – the answer is above your head – it’s your hair! Each time you pass by a mirror, the one thing that strikes you is the hair on your head. Hair is something that grows by itself without any help. Well, actually, brushing and combing and even oiling it does help or else you tend to lose your hair. Though the most noticeable presence of hair is on the head, it grows all over the body – out of the ears, on the chest, upper lip, cheeks, arms and legs. The only place hair doesn’t grow hair is on the lips itself and on the inner palms of the hands and feet. Basically there are two types of hair – the thick, coarse hair on the head and face and the light fine hair on the arms and legs. Hair is a kind of a skin tissue that is hardened by a protein called keratin. Keratin is what covers the outer skin and that is why hair grows on all these places too. The hair cells constantly multiply under the skin. Each cell keeps dividing and creating more cells. The new cells push the old cells above the skin surface and that’s how hair grows. Of course, once the hair cells are out on the surface, they lose the ability to multiply. They become dead cells. And that is why hair acts as a protector. It protects the head by keeping it warm. This was a very important function in the early days when humans used to live in caves and had to face intense cold. The fact that they were very hairy protected them from the winter cold. Another function of hair is to protect the delicate parts such as eyes. Eyelashes, for instance, prevent dust from entering the eyes. Hair in animals also acts as a camouflage. Beneath the skin, hair begins to grow inside a small tube called a follicle. As it grows, it pushes upwards through the skin. Blood vessels in the follicle feed the hair root and help it grow. 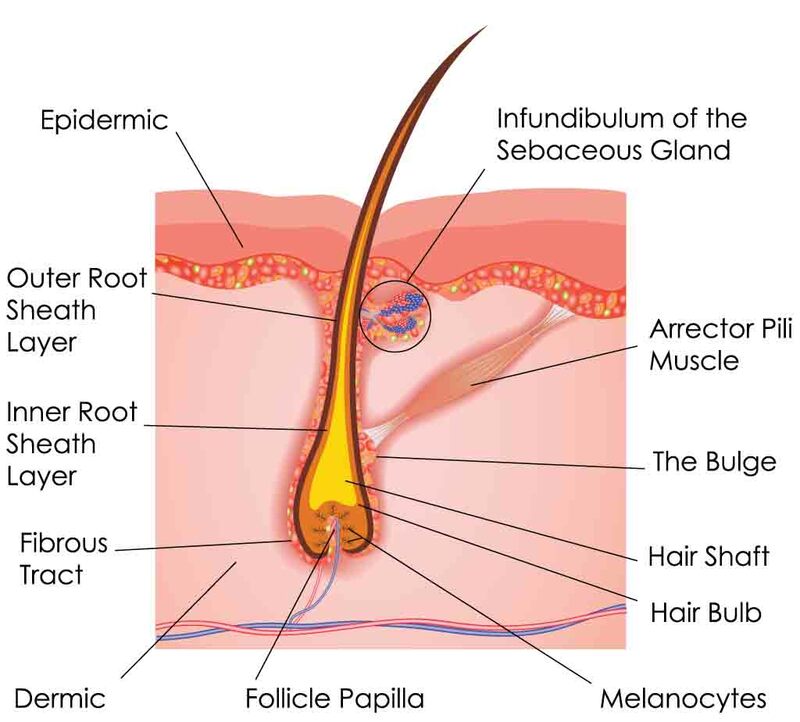 In every hair follicle is an oil gland called the sebaceous gland. These oil glands provide shine and gloss to the hair. There are over 100,000 hairs on your head. If hair is not cut it can normally grow over to five feet and sometimes 10 feet or more. The reason we do not have such long hair is because it grows at a rate of only about half an inch in a month. Also, we shed 50 to 100 hairs every day while washing and combing. 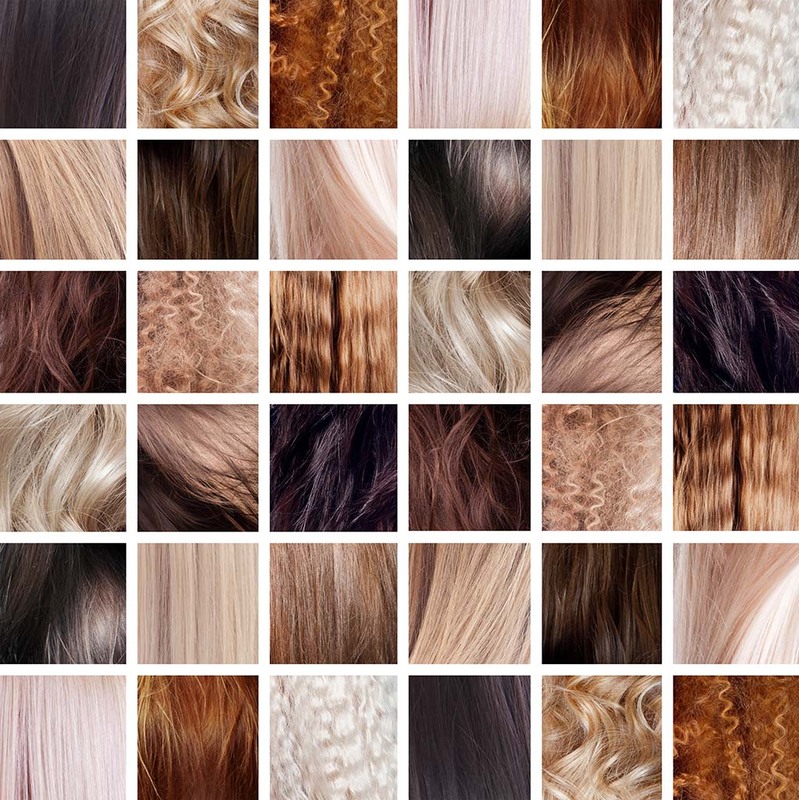 Hair comes in a variety of colours: blonde, brown, red, black, etc. This is due to a pigment called melanin that gives hair and skin its colour. The colour of hair depends on the parent’s genes and the amount of melanin present. The lighter someone’s hair, the less melanin he or she has. Hair care is very important. Rubbing hard or yanking hair while combing a tangle can cause hair to break. Dirty and unkempt hair also attracts lice. Shampooing hair and gelling hair keeps hair conditioned and gives it a wavy bounce. However, luxurious and shiny hair doesn’t come from conditioners or shampoo but from healthy food and nutrients. Hair sometimes turns grey. Sometimes young people have grey hair mixed with their dark hair. Heredity and old age are important factors attributed to graying hair. As we grow old, the middle layer of hair ceases to produce colour pigments normally distributed through the hair cells. Lack of colour pigments turn hair colour grey. Not for nothing is hair called the crowning glory. It frames a face and makes it attractive. People spend enormous amounts of money on wigs. The study of hairstyles and hair ornamentation down the ages, is a fascinating area of study. And, very often, one can spot old styles returning after a while. People from different cultures have different ideas of what makes for a beautiful hair and style, especially when it concerns women. For example, in India and many other Asian countries, long, black hair is supposed to the mark of beauty whereas in the West, blonde and shoulder length hair is considered most attractive. What kind of hair is thought attractive differs from culture to culture and according to the fashion of the day. These range from a “normal” crew cut to long plaited hair, attention catching dreadlocks or even the Mohawk style that has all the hair standing on end. The hairstyles of famous film stars have always influenced the fashions of the day. Among certain communities like the Sikhs, men and women are not allowed to cut their hair. The men wear a turban covering their hair. People put in beads, plait hair, perm it, dye it, leave it open or tie it all for a reason – to look appealing. That does not mean that a clean-shaven head is not attractive. While Samson might have lost all his powers after having his hair chopped off by Delilah, Hollywood actor Yul Brynner is a bold example of baldness.